In 1980 I played the Grand Ole Opry the very first time. My two songs were in Roy Acuff’s segment of the show. Of course, Roy grew up with old time music, played it himself and loved it. He didn’t know any young people playing the old-time style and he was very enthusiastic of me being on the show. We became fast friends and I would always visit with him when I played the Opry. Roy was always suggesting old songs of his I should learn. I remember him singing “Bang Away My Lulu” to me and telling me I ought start singing it. From the Opry I was invited to be on Hee Haw. What a joy that was. The cast would spend a week in Nashville taping the shows. There was always lots of down time which meant more time I could spend with Roy and Grandpa Jones. 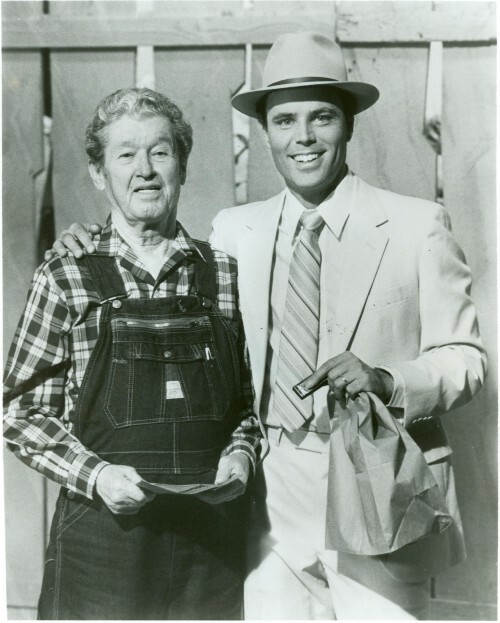 I taught Roy how to play the paper bag for one of the Hee Haw shows. When Fire On the Mountain ran on the Nashville Network (1984-1989) Roy was a faithful viewer and would often contact me about shows he particularly liked. Roy was a collector of vintage ties and he knew I wore old 1940s ties on the show and sent me several from his collection, which I cherish. Roy Acuff was a wonderful man. Everybody loved him and so did I.